Central 1 used ThoughtFarmer as the primary communication channel to unify their company culture under a mission of Service Excellence. Credit unions are thriving, attracting more members than traditional financial institutions through outstanding service. Central 1 is the central financial facility and trade association for the B.C. and Ontario credit union systems. In order to better serve their growing customer base and strengthen the credit union system as a whole, Central 1 needed to embrace the philosophy of member-centricity inside their own organization. They set out on a mission to foster a new corporate culture of Service Excellence, and they needed a centralized communication channel to mobilize this transformation. Central 1 creates the products credit unions need to compete against large-scale banks. The 112 credit unions they serve represent a member-oriented, full-service retail financial system that holds over $115.7 billion in assets. In 2013, they embarked on a strategic initiative to transform their culture from a traditional product-based company to a member-centric company. This new vision would better align Central 1 with credit unions’ values and support credit union growth and differentiation in the marketplace. It also required reframing how each Central 1 employee worked each day: changing internal processes and goals to align with the member’s point of view and their needs*. Alexander Osterwalder defines corporate culture as “the values, beliefs, and behaviours practiced by an organization”. Trying to change behaviour (as any of you out there with change management experience can attest to) is hard. But trying to change deeper emotions like values and beliefs is even more difficult. The Central 1 Communications team realized that they faced a huge hurdle—they lacked a central channel for communication with employees. Current communication systems were stale and fragmented. The previous SharePoint-based intranet was difficult to manage and update, leading to outdated content and an over-reliance on email. There were no social features, so employees could not engage with content or share feedback. The overall experience was not employee-friendly, which made it even more challenging for them to deliver on member-centric goals. Behind the scenes, Communications and IT teams were also frustrated. Communications was unable to manage and execute on their initiatives. Meanwhile, the technical team—whose primary focus is creating value for members—often had their attention diverted to fixing legacy internal systems. If Central 1 was going to be successful at changing an entrenched corporate culture, they needed to be transparent about the goals and progress of the company. They needed a platform to communicate these goals, engage employees, and spark collaboration to achieve them. They needed a flexible platform full of fresh content, that empowered the Communications team and unburdened the IT team. Recognizing that building a new SharePoint intranet to meet these new and critical needs would not be cost or time effective, Kim Pettersen, Director of Internal Communications and Engagement started researching out-of-the-box intranet solutions. She also started collaborating with other departments, like IT and HR, to align their intranet objectives and built a strong, collaborative business case. Together, they created goals of encouraging dialogue, improving findability, and increasing transparency. Plus, they wanted to reduce the time it took for Communications to publish articles, and reduce the amount of IT resources required to host and develop the software. Central 1 selected ThoughtFarmer for its easy to use publishing tools, easy to launch and maintain technology, and its focus on engagement tools. They believed the simple yet effective interface would encourage quick adoption, allowing them to focus on their core goal: shifting toward a culture of member-centricity. Kim also said that it makes her job a lot easier, knowing that ThoughtFarmer is doing the work to stay on top of intranet trends. Plus, Central 1 took advantage of ThoughtFarmer’s professional services, to augment their own intranet-expertise, and launch faster and more successfully. Intranet projects commonly cause frustrations and conflict between IT and Communications departments, but Central 1 did it differently. Both teams agreed the intranet was key to delivering on the culture change. With a shared goal in mind, collaboration was easy between Kim and Systems Lead, Miguel Tena. “Despite coming from a SharePoint background, he really listened to the challenges we were having, and was open-minded about collaborating on an alternative platform” said Kim. Shifting ownership of content publishing from IT to Communications empowered Kim’s team to manage communications on their own. Less support requests meant IT had additional resources to dedicate to enhancing the employee experience on the intranet, as well as continuously innovating their other applications to improve service for credit union members. When Central 1 launched their intranet they made it more than just a piece of technology, it became the heart of their culture. Kim and her team knew buy-in was essential for adoption, so they involved employees right from the start. Prior to launching, the Communications team generated interest by holding a naming contest. Employees submitted 120 responses. The Communications team then reduced the number to three and turned it back to employees to vote. 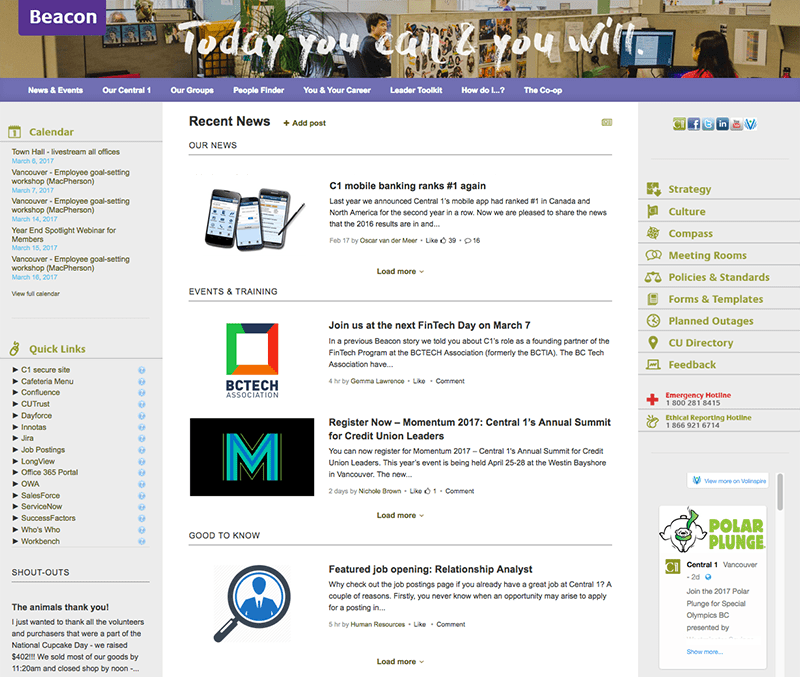 The name chosen for Central 1’s new intranet was Beacon. On launch day, an employee announcement was posted on the homepage introducing Beacon as Central 1’s newest team member. Offline, employees were barraged with fun advertisements of Beacon. 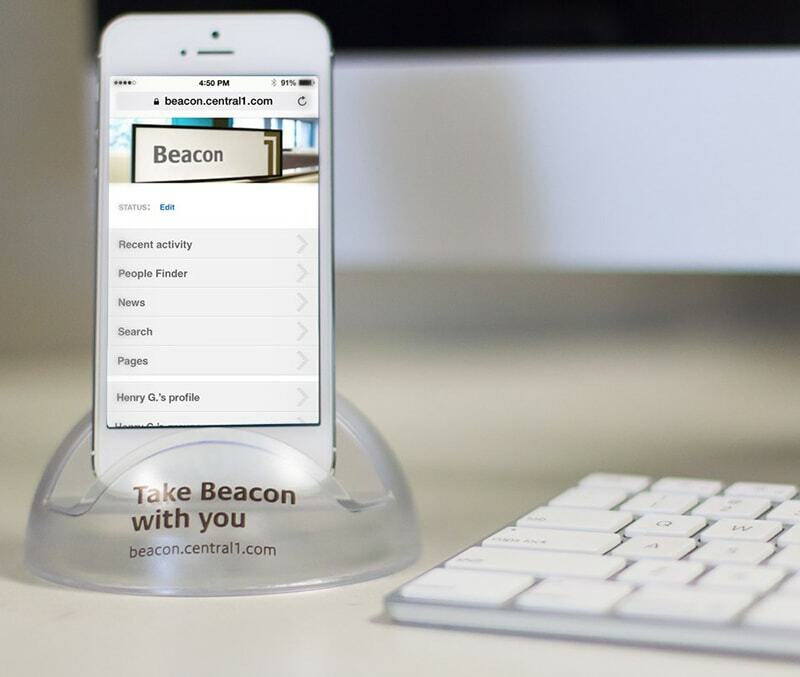 One example is a custom iPhone holder that said “Take Beacon with you,” which promoted the ability to stay connected through mobile. In 2013, Central 1 adopted a strategic initiative to transform their corporate culture from one that was product-based to member-centric. Three years later, Central 1 has noticed a big difference in the way they do business. Beacon has helped centralize communications and put service excellence at the forefront of employees’ minds. While culture is an ongoing journey, the intranet has played an integral role in catalysing the change and propelling their new vision forward. Financial: By switching from SharePoint to ThoughtFarmer, Central 1 was able to reduce their intranet operating costs by over 70 percent. Internal Business Processes: Transferring ownership of content publishing from IT to Communications helped to forge a strong partnership between the two teams. IT was freed up to work on enhancing services for their members and Communications could focus on delivering the culture change. People: Beacon serves as an important channel for aligning staff on strategic goals, reporting on progress, and celebrating successes. As a result, Central 1 has increased employee engagement by eight percent in two years – an accomplishment only achieved by 26 percent of organizations in Aon Hewitt’s database. Members and Stakeholders: Engaged employees translates to happy members and optimal financial performance. Organizations with highly engaged employees have been shown to improve their operating income by 19.2 percent*. See what ThoughtFarmer can do for your organization. Sign up for a 30-day free trial.